Nicotine Replacement Therapy Products (NRT) are now available for free for Medical Card holders. 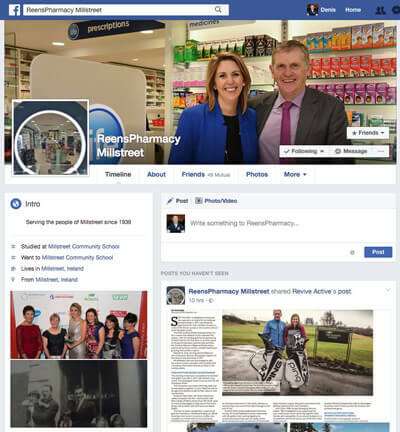 Visit your GP first for approval. At Reens we provide help through free consultations to assist you to come through the quit process, healthier and happier. 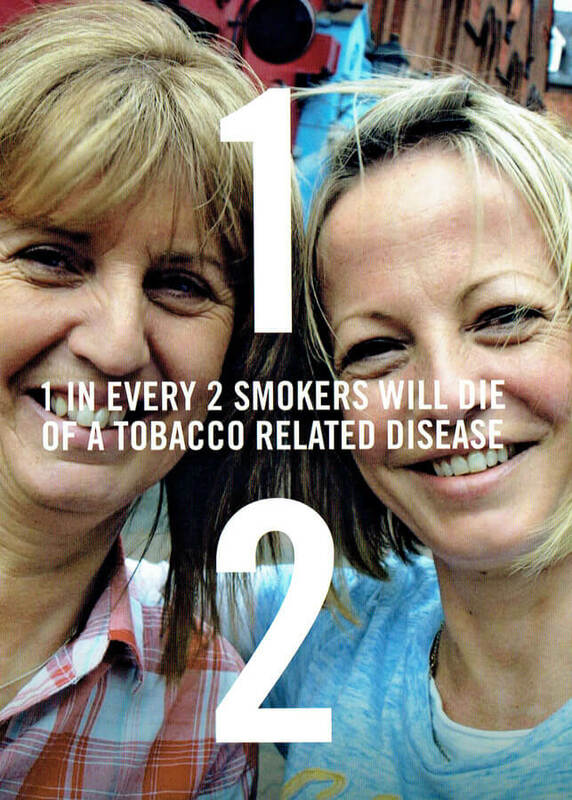 At Reens we have helped hundreds of people quit smoking. 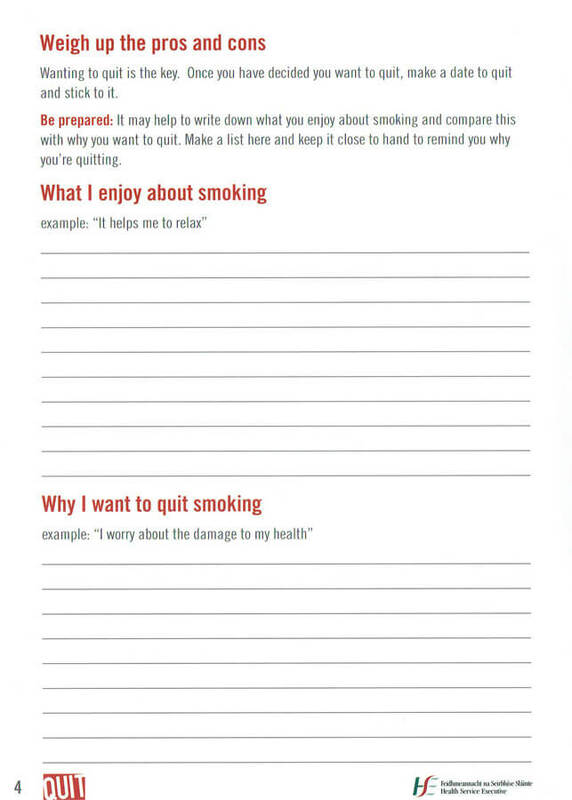 We provide free consultations (Book One Now) where by asking you a few quick questions about your smoking habits and lifestyle, we can help you choose the smoking cessation product best suited to you. Nicotine Replacement Therapy Products (NRT) are now available for free for Medical Card holders. Visit your GP first for approval. 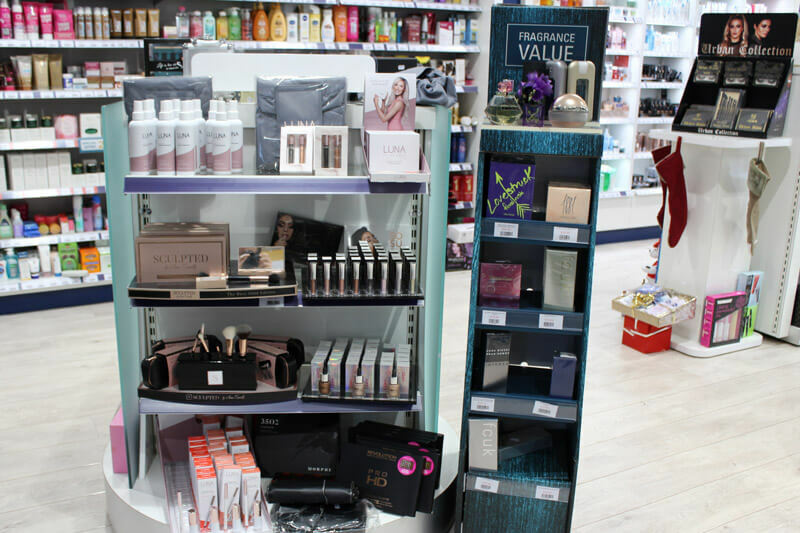 They include mouthspray, inhalers, lozenges, patches and chewing gum. 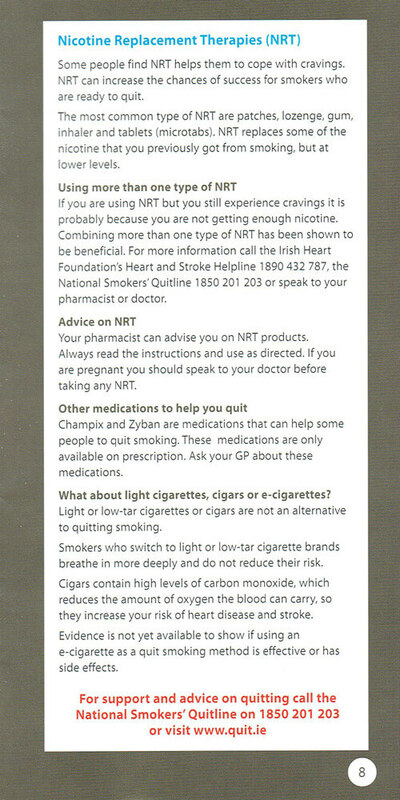 NRT does not “make’ you quit smoking – will power and determination helps you break the habit. 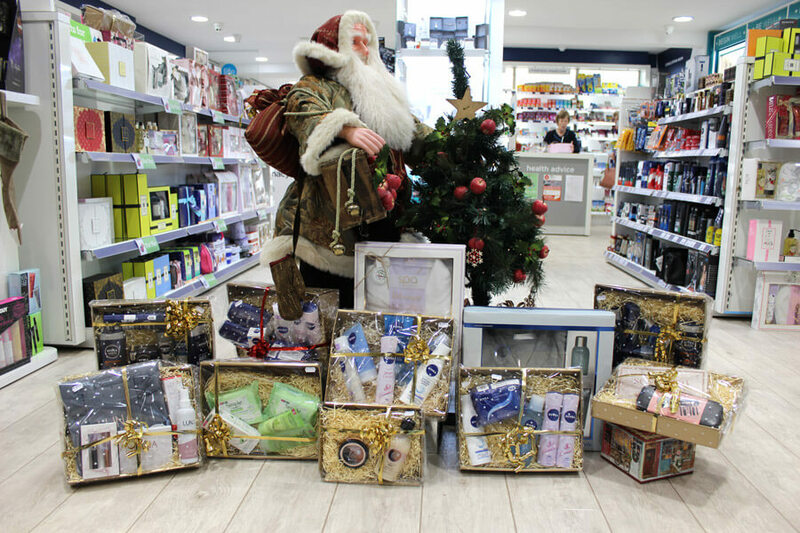 There will be temptation but, your Reens Life Pharmacist is here to help you succeed in your attempt to quit. The HSE also offer a free support group six week course we can discuss with you at a consultation. 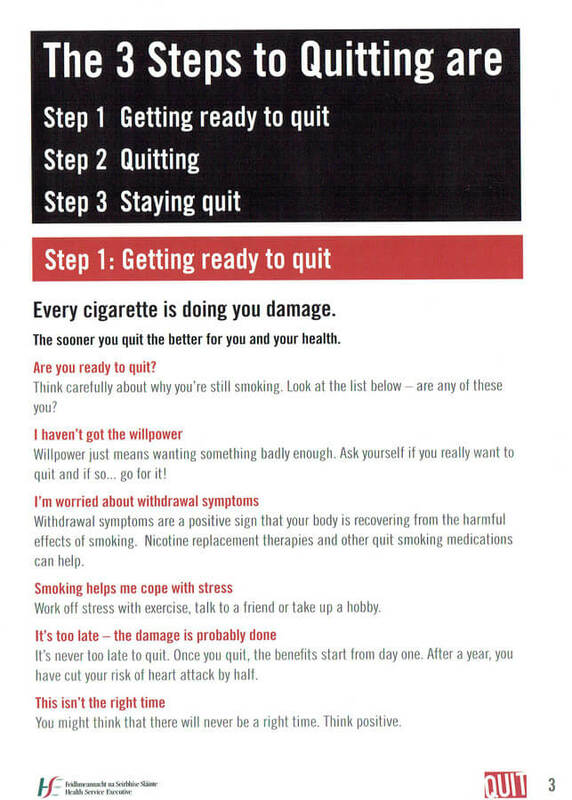 We have more information, video’s and help booklets further down this page in our Quit.ie website section here. Not every one will quit successfully using nicotine replacement therapy, so you can talk to us about alternative medication available on prescription from your doctor. Some people find electronic cigarettes useful if they are trying to quit or reduce the number of Cigarettes they Smoke. But the long term risks and health benefits associated with electronic cigarettes are, as yet, unknown. 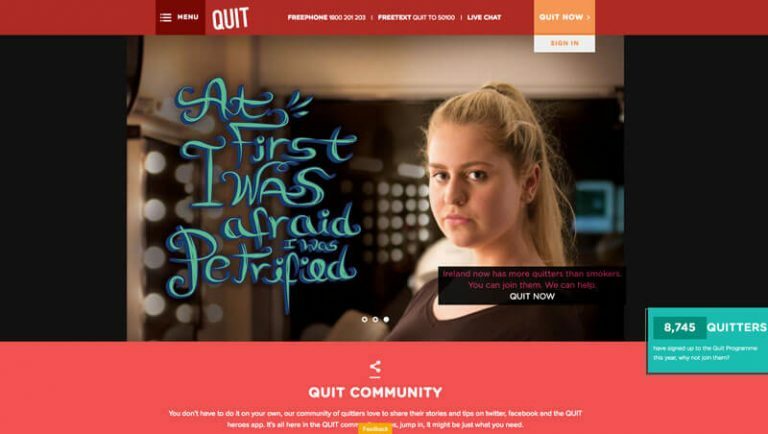 The HSE has a website Quit.ie dedicated to helping people who wish to quit smoking. 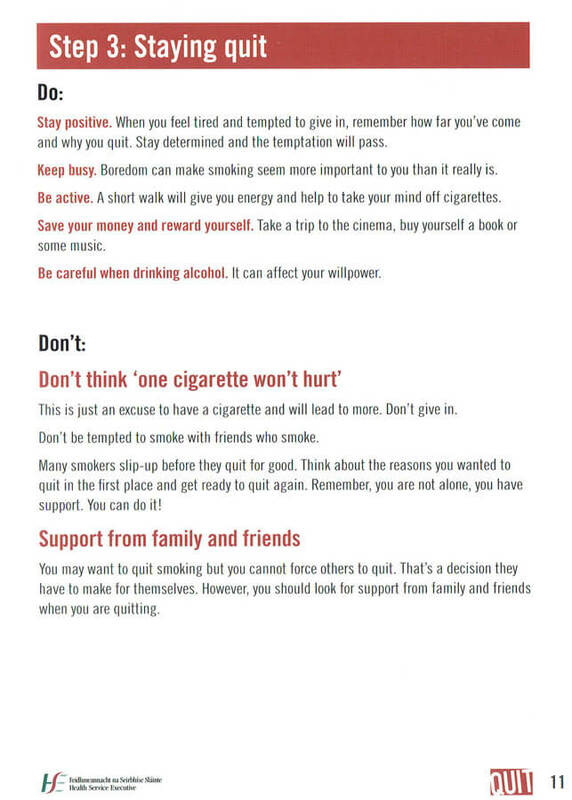 On the website you will find details of free Cork Quit Smoking Groups you can attend weekly like the one featured in this video. We also have the course booklet You Can Quit below that they use. 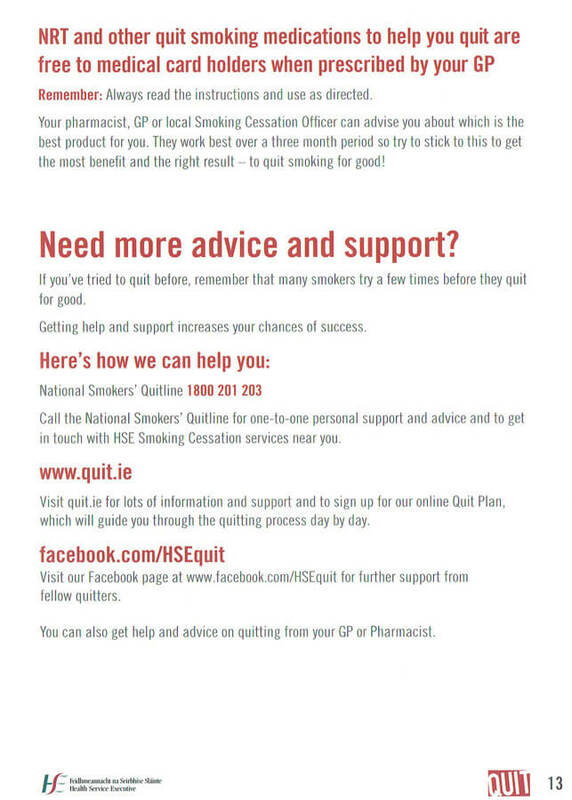 This video features Philip Arnold from Cork who attended the six week course run by Quit which is available in Cork. 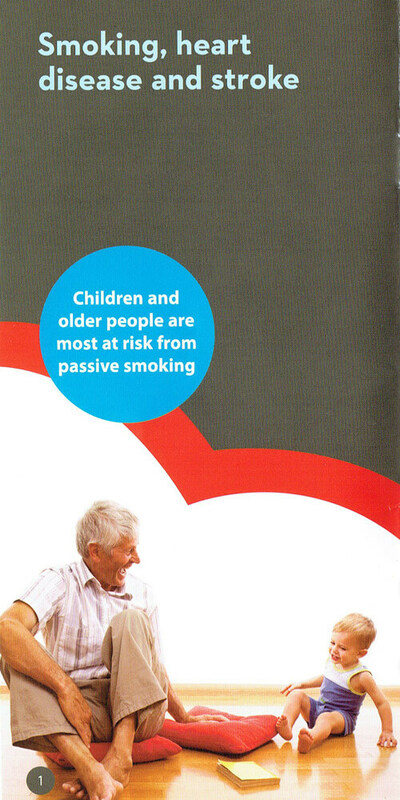 It also references the Nicotine Replacement Therapies that they use available in Reens plus we have the course booklet right here. 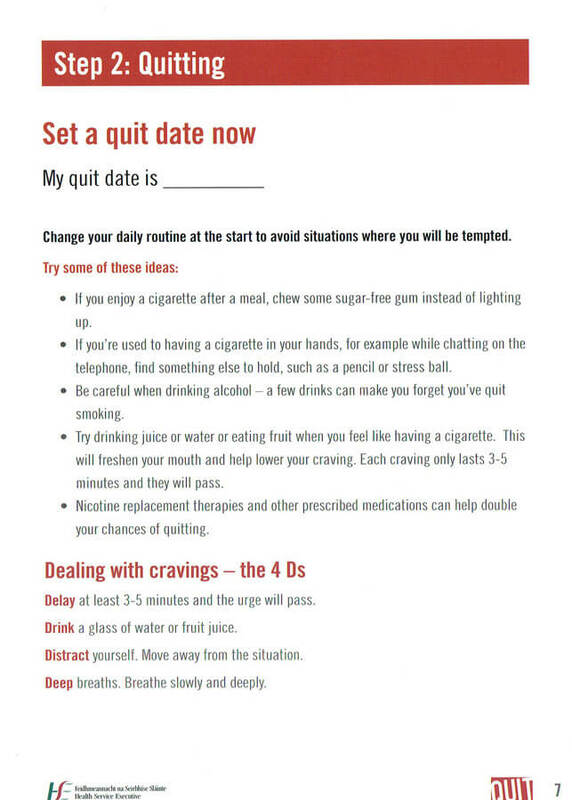 Check out the weekly plan, diary and quitting aids. 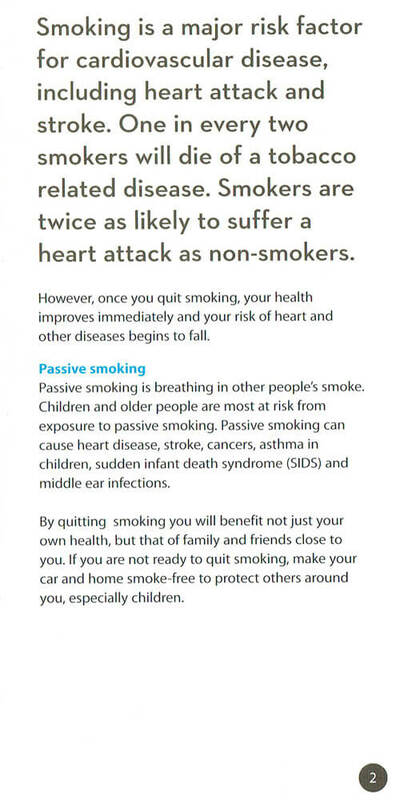 Click the image to visit the HSE’s Quit.ie Website for lots of useful information. Or call their helpline on 1800 201 203 or freetext QUIT to 50100. They also have Live Chat online plus helpful videos, tips and advice plus contact details for courses. 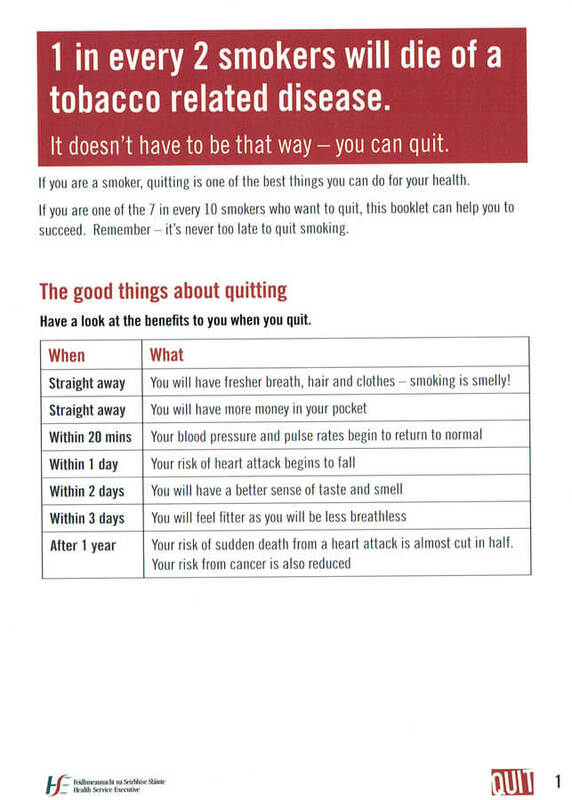 Using NRT products will double your chances of quitting for good. Nicotine Replacement Therapy products are now available for free for Medical Card holders. Visit your GP first for approval. 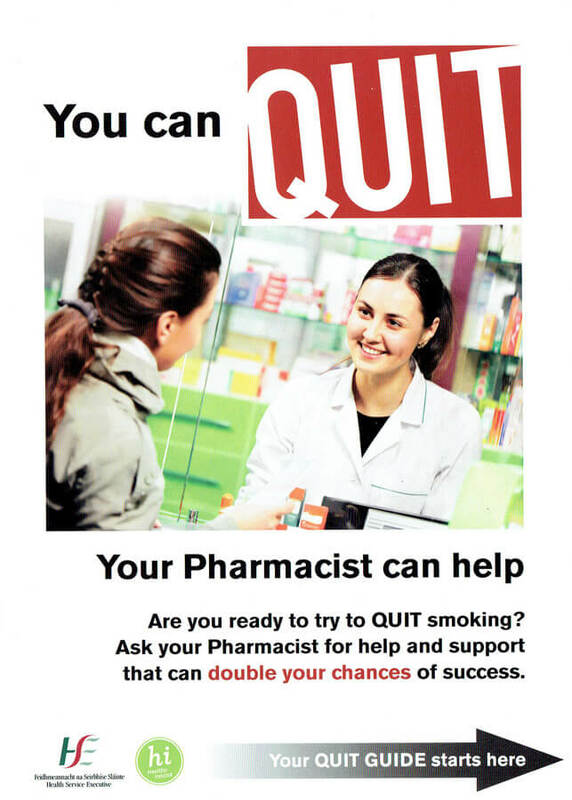 Ask our Pharmacist for advice & support as you try to quit. Getting support more than doubles your chance of success. NICORETTE® QuickMist starts to act in just 60 seconds to give you fast relief from your cigarette cravings. 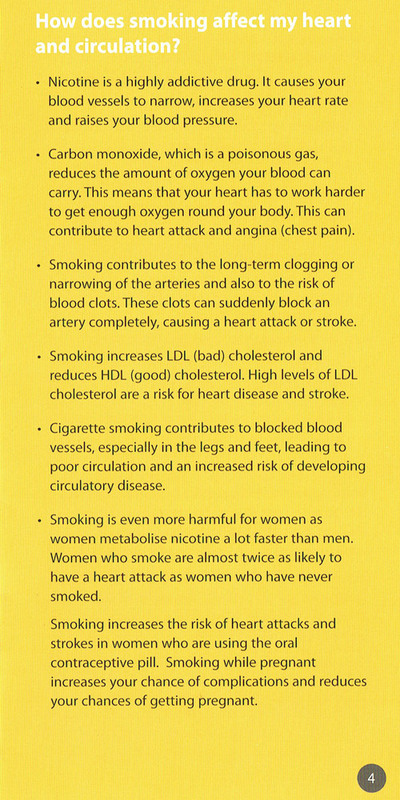 The nicotine is absorbed quickly into your body through the mouth lining, helping to rapidly relieve the urge to smoke. Watch the video above on how to use the mouth spray correctly. By replacing the nicotine you would normally get from cigarettes, NICORETTE® Inhalator enables you to reduce or quit in a way that mimics the act of smoking. 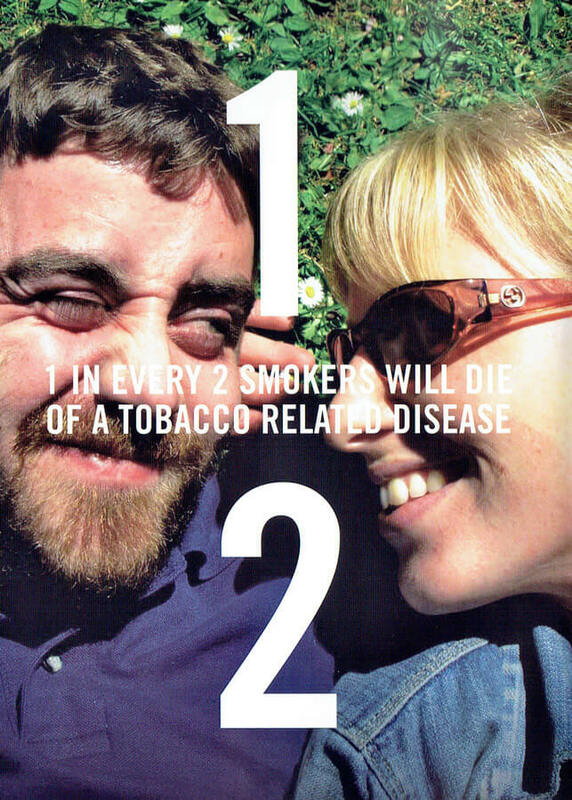 Watch this video above from Nicorette showing the product. NICORETTE® Cools lozenges use dual layer technology. As the lozenge dissolves, it delivers therapeutic nicotine to help relieve your cravings and other withdrawal symptoms. The icy mint flavour is also gradually released to provide you with a long-lasting cooling taste. Watch the video above advertising the lozenges. The Nicorette Invisipatch provide a steady flow of nicotine to the body for up to 16 hours, making it much easier to work into a regular once-a-day routine, keeping nicotine cravings at bay during the day when you need it most. Using Nicorette Gum means the nicotine is absorbed quickly through your mouth and gums, relieving those unpleasant withdrawal symptoms soon after they strike. Each piece of gum delivers a controlled amount of nicotine into your body – enough to satisfy the craving, but not as much as a real cigarette.Watch this video above that shows how best to use the gum. Prices correct as of 11/01/2019 and are subject to change. 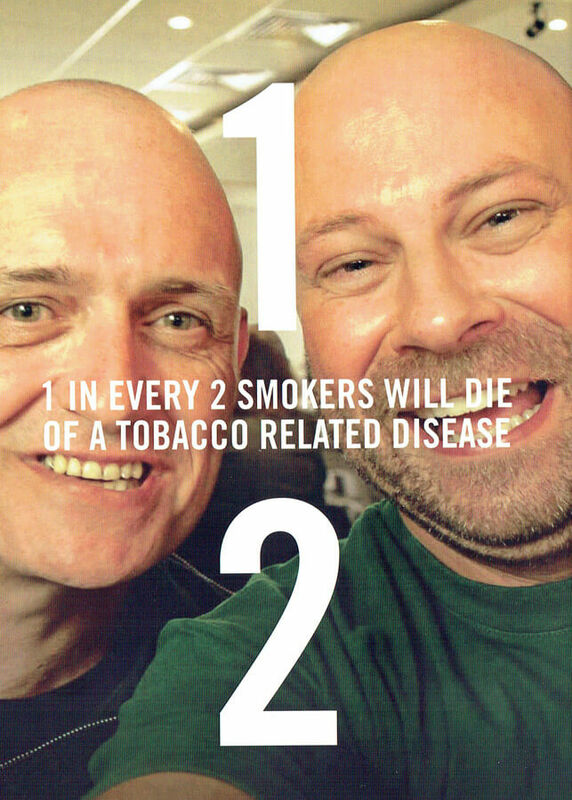 Half of all Smokers die from smoking related diseaes. 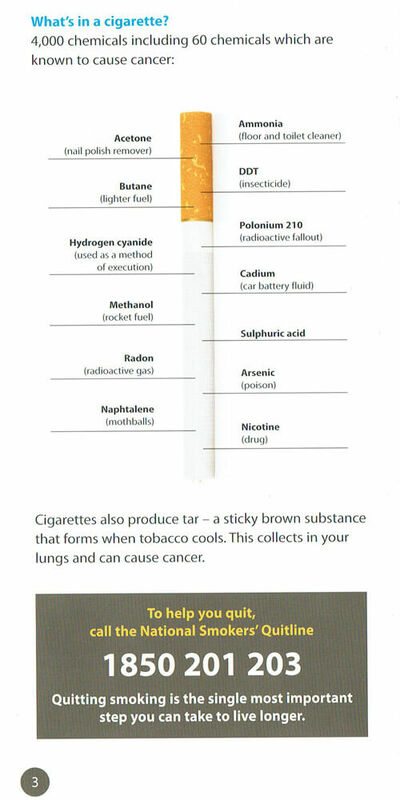 Tobacco smoke contains over 7,000 chemicals, many are poisonous and over 6O are known to be Cancer Causing. Smoking is an addiction but with the right help it’s never too late to quit. Our team are here to provide encouragement, educate you on what to expect when you quit and help you to manage your withdrawal symptoms and cravings. 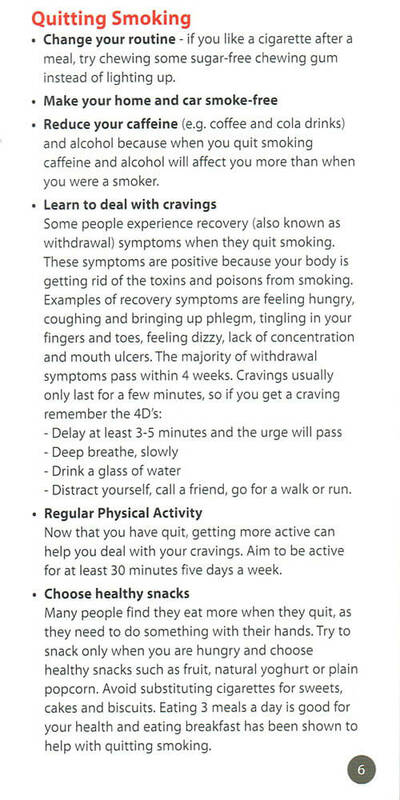 We can advise you on fighting those everyday smoking habits and provide help for you to come through the withdrawals and cravings on the other side, healthier and happier! Make a list of why you are quitting – pros and cons. 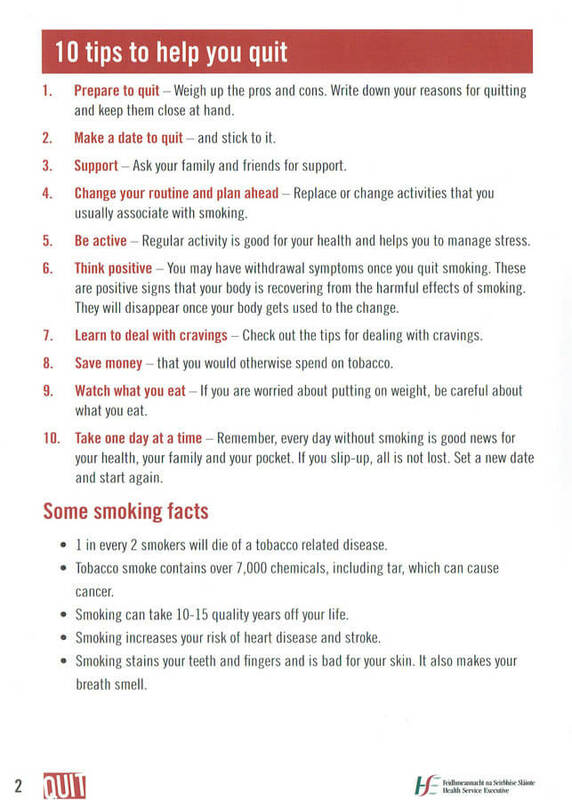 Gradually cut down your smoking. Pick a date and stick to it. 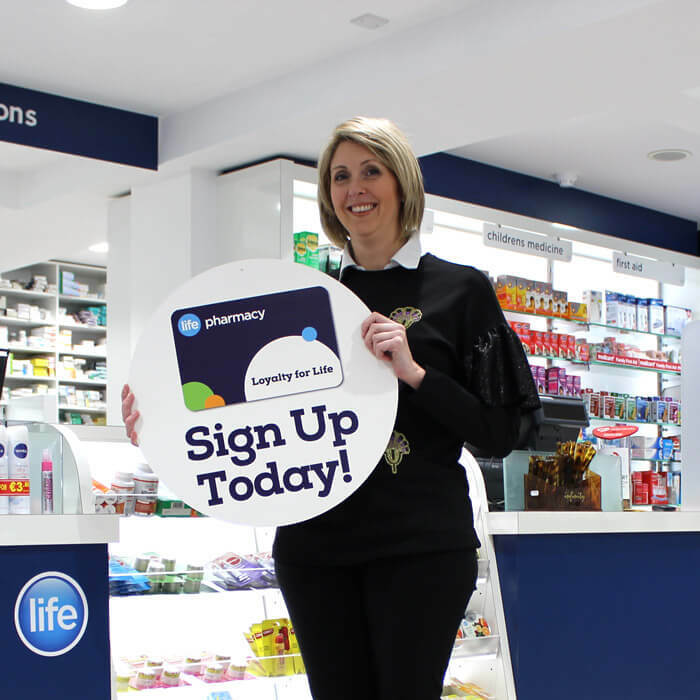 Your Reens Life Pharmacist can encourage you to quit and can help you on each step you take. Speak to a family member or friend to provide you moral support. Talk to your GP for support. Remember they only last 5 minutes! Distract yourself, move away from the situation. Drink a glass of water or fruit juice (sip slowly). Put away the amount of money you would normally spend on cigarettes per week and watch it grow! 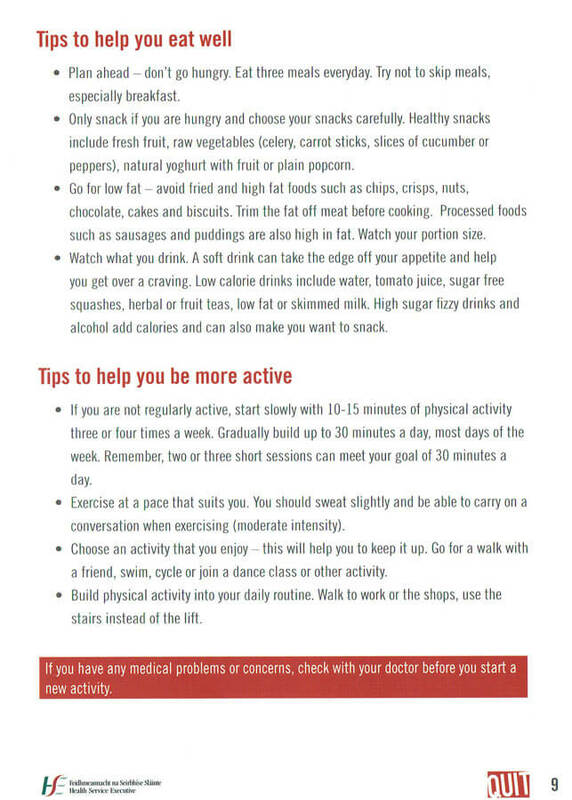 Avoid snacking on high sugar snacks. Try sugar free gum or fruit. It may take a while to get used to being without a cigarette in your hand but remember that list of why you are quitting. 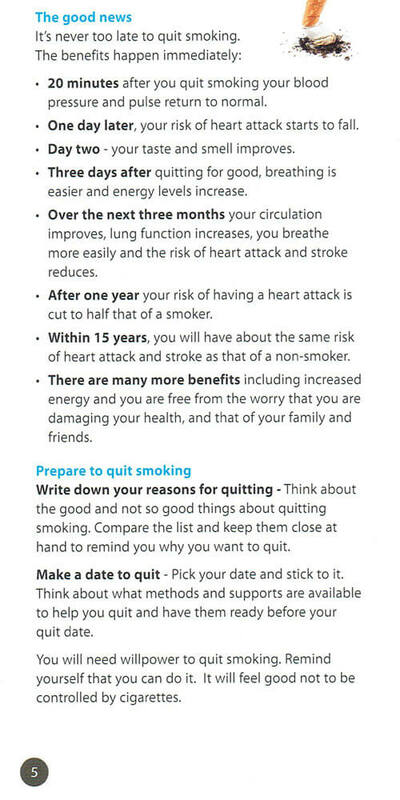 After one year of quitting, your risk of heart disease is lowered by 50% compared to when you were a smoker. Don’t be worried about withdrawl symptoms: They are common. 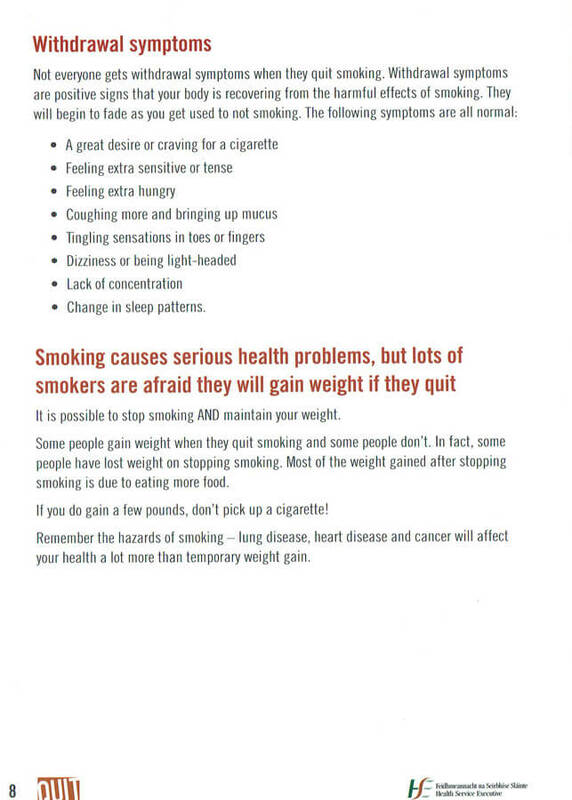 They are positive signs that your body is recovering from the effects of tobacco. 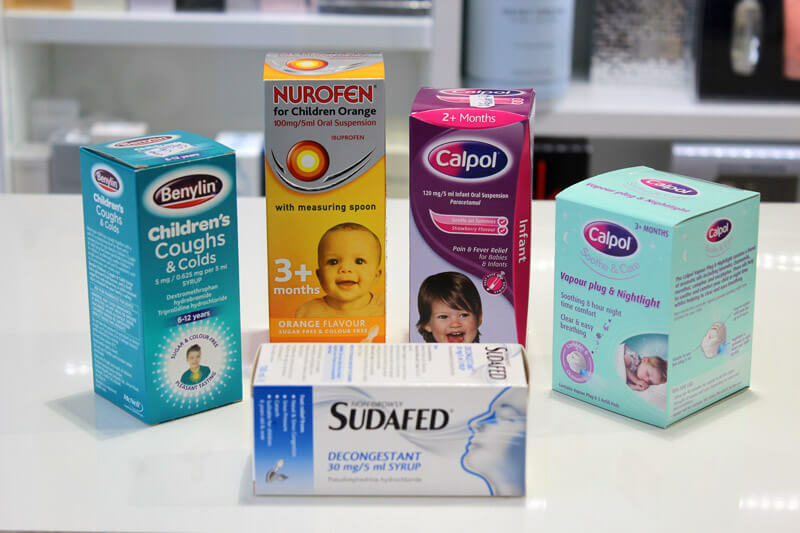 Research has shown that people who get help are twice as likely to succeed and those who use NRT products (patches, gum, lozenges or inhaler) with help are four times as likely. 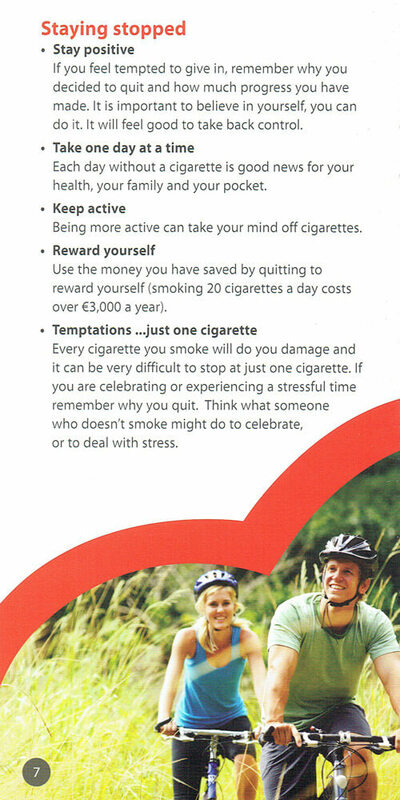 At Reens Millstreet we provide free stop smoking consultations to those who are ready to break free. 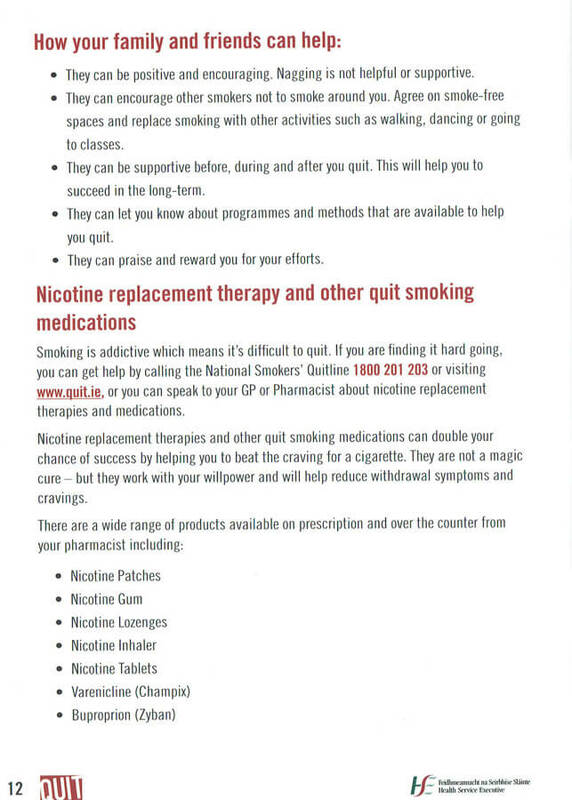 In our consultation room we provide advice, helpful tips, information on suitable Nicotine replacement products and prescription medications available.